LOWER MANHATTAN (WABC) -- The soaring centerpiece of the new transit hub, the World Trade Center Oculus, has become an Instagram hit. The massive $4-billion dollar white steel and marble hub opened last Thursday, March 3. Architect Santiago Calatrava designed the Oculus as a symbol of resilience after the September 11th attack. The Oculus has inspired many Instagrammers to post photos, but the reaction is mixed. Some who shared photos using #abc7NY are inspired. @mdeuadros writes "The #oculus is a stunner... spectacular in every way." Others are not so impressed. Instagrammer @biggz3579 writes "4 billion dollar piece of trash.... already has water damage, not one single shop is ready and no public restrooms..."
Officials say many changes along the way and logistical complexities caused the increase in cost. No matter how you feel, we invite you to share your photos of the Oculus at the WTC using the hashtag #abc7NY. 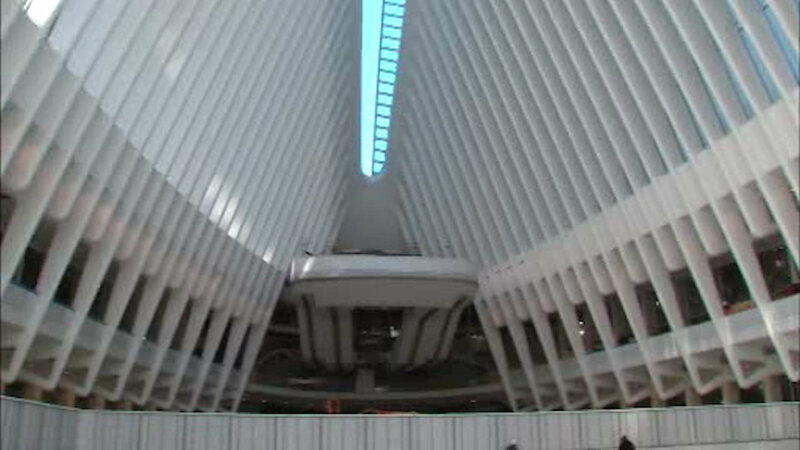 The new World Trade Center transportation hub is officially open to the public, with New Yorkers and tourists alike getting their first look inside the so-called "Oculus."